You need both a fat toxin and a carb toxin. Looks like cornstarch is the carb toxin in this study. It used to be that soybean oil, corn oil, or safflower oil were the favored fat toxins, but I've noticed that diet researchers are diversifying their toxin portfolio. They often use some kind of industrial lard that seems highly toxic, not sure where they get it. But Crisco is a great idea. Hydrogenated PUFA is about as toxic as a fat can get, so this group ought to be publishing fiends! They are. They can even correct their mistakes. I need to have quite a few tables in the next post and I can't do this on my work computer, where I am stuck all weekend, so it might take some time. Great "deconstruction" of the study Peter! Too bad they didn't try using natural fats ... instead they used the exact fats that they spent the last 30 years telling us to eat (until just recently as the bodies piled up). So to test the effect of varying macro-nutrient compositions on rats, feed them varying amounts of sucrose or cornstarch for the CHO, and corn oil or trans fats for the FAT. McGarrison had some respect for his rats: he fed 'em good quality rat food. Even the controls do not get good food. As Brendan Behan would say, "it's a load of b***ocks" or "s**te" in Gorbalese. It deals with different types of fats. Yeah, a 17% transfat diet ... *sigh*. 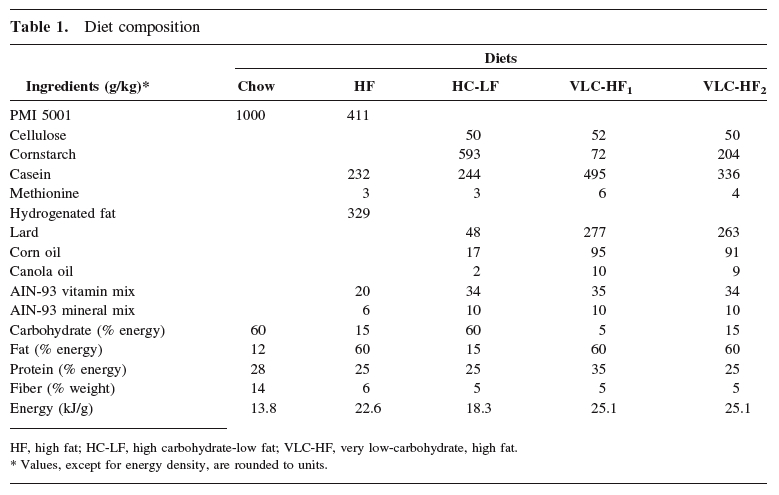 However that study has limitations in that it is not truly "high fat" either, there were sufficient carbs. That said, I just posted about a rat study on the effects of HC after a ketogenic diet in rats. Of interest to your Ratty, would be the results from the first 8 weeks where the rats were on a ketogenic diet. Carb Sane. We all love Ratty but his brain is small, it doesn't need much glucose and no one is going to make ketones if they can meet their glucose needs without. As you know you need to be near 80% fat to get ketosis in a rat. If it's correct then anyone advising a person to discontinue the Atkins Diet has blood on their hands! Axen and Axen's papers do not support the N and M conclusions, but A and A didn't use full ketogenic diets of course. After deconstructing as many studies as I have I am very loathe to be worried by those I don't have the information to deconstruct. Why is the information not there? As I commented on another blog, the fact that the rats (N & M paper) had more adiposity and didn't need more calories to maintain weight leads me to suspect they used some nasty stuff. 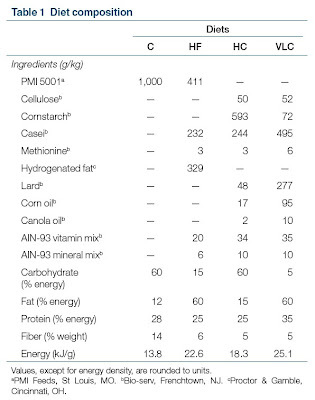 I've never seen ketogenic diets not induce fat loss even with a decent amount of corn oil. That macronutrient table screams subterfuge. Me, cynical? That must have been a triple word score Gary! My two rats are barely a month old and eat the same kind of diet you describe - ad lib and high fat, mostly cheeses, animal scraps that my teeth cannot physically get to, and spare nuts. They can smell bacon from two rooms away and will go insane until they are given some. Ah, fun stuff again, thanks again to Peter and to the other contributors ! My oldest is also fond of multi-colored nails! Toes and fingers. Hi Emily, the fingers went for a while, I think the toddler girls at nursery had made comments, but they're back on again alongside the toes, when he remembers! Neo, We have a system on novisual extra mural segregational noninteractive diet selection. The cat eats ground dead pigs and the rat eats whatever he gets, unless it's a grape. Peter, you said on the previous thread you always had enough fish oil to activate PPAR-gamma. I think my high-fat diet of the last 20+ years had given me some kind of diet-induced lipodystrophy due to non-activation of PPAR-gamma. A few weeks ago my BMI was below 16kg/m2 and yet I was well into IGT territory. Just over a year ago after a period of terrible stress and undereating I increased my carbs in an attempt to put on weight. This time (unlike a previous foray into “healthy” eating) I did not reduce my (mostly saturated) fat intake. Up to 3000kc per day and still I was losing weight and became glucose intolerant. I think I figured out I have been suppressing/not inducing PPAR-gamma, and as fat cells have died they haven’t been replaced (apparently PPAR-gamma is vital for adipocyte differentiation). I have now cut back on fat and increased carbs and fibre (a la FIAF) and have actually finally managed to gain a little weight. I hate this way of eating though; my joints hurt, my skin itches, I’m getting palpitations and I feel quite unwell. It is almost tempting to risk the adverse effects of a thiazolidinedione to speed up this process so I can go back to my normal way of eating as soon as possible. I cannot bring myself to eat any polyunsaturated vegetable oil, but fish oil makes me vomit (yet fish doesn’t). I’ve added a bit of smoked salmon (the only PUFA I can stomach), whey protein (insulinogenic) and red meat (for the carnitine) but would appreciate any other thoughts on the quickest, most “painless” way to gain weight (and improve IGT). This was my first hit, there will be many more. I would absolutely be looking for an acquired version of the congenital condition of Berardinelli–Seip syndrome. The acquired form is auto immune in nature and I would always ask about GI dusfunction and gluten as core to auto immune problems. I can see why a BMI of 16 is frightening. Simply increasing the size of fat cells using hyperinsulinaemia might just lead to bigger and more insulin resistant fat cells. I suspect stem cells are always produced but an auto immune problem simply kills them off before they become functional. I think you need to be looking further than fat types here. Further minor thoughts: Athletes have large amounts of intramyocyte triglyceride without significant insulin resistance as they probably have large number of highly functional mitochondria for whatever self punishment they enjoy. I do wonder if serious resistance training at low intervals might help with the muscle IR. It wouldn't replace fat cells but it might reduce the hyperglycaemia. I'm just thinking about short term fixes for the hyperglycaemia while you see what can be done to research and try to correct the underlying adipocyte loss. "I do wonder if serious resistance training at low intervals might help with the muscle IR. It wouldn't replace fat cells but it might reduce the hyperglycaemia." Being on OD for several years, I started to do a High Intensity Training once a week - glucometer readings are lower the next few days. The first reading after a training session more often than not suggests there is no spike at all. It seems all the glucose is immediately soaked up by muscles, after the liver got it shares. Gained 6 kg in nine months, mostly muscle. I guess it must be less than 0.5 g trans fats per serving. Well, the "mono and diglyserides" are present code names for transfats, needed for structure. I bet the stuff would be really expensive to make as a drug grade chemical! "I do wonder if serious resistance training at low intervals might help with the muscle IR." Since curing my blood sugar problems 4 years ago with a Real Food high fat diet, My fasting blood sugars have been in the 95-100 range. Post meals usually 105 or so, with occastional foraysinto 113. I started doing CroosFit, and now my fastings are 71-78. Post meals are 95. Randoms are in the 77-85 range. So my N=1 seems to indicate that Crossfits high intesity short workouts seem to lower blood sugars. It's the only change I've made and I only do it twice a week. Believe it or not Crisco was originally developed to make candles. When electric lights became common Crisco was then diverted to the human food chain. I’ve had the coeliac antibody tests – negative, but have definitely got some kind of wheat intolerance. I can eat it occasionally but God help me if I eat it twice in one day. I also have non-PA B12 deficiency so I think wheat/autoimmune could well be a big contender. I don’t look quite as scary as some of those lipoatrophy photos, but I guess it could be early days. I’m going to try complete wheat avoidance and see how that goes. I had already decided to increase activity to improve insulin sensitivity (sans antioxidants thanks to that previous post – thanks). I already have a fairly active job and high NEAT but will do this anyway. Since the high FPG and OGTT a few weeks ago I decided not to even bother checking BGs until I grew myself some new fat cells – I’ve always been naturally a low carber, and I think high readings will be a sort of further (carb) “aversion therapy”. Dave, the problem is I’ve been a high-fat, low carb eater for over 20 years, but increased carbs over a year ago to try and gain weight. I don’t want to just gain muscle mass – I want body fat; my face has aged 10 years in the last 18 months and I look like Gollum with my clothes off! I also started wondering about the B12 deficiency; I take sublingual methylcobalamin, but didn’t take the adenosylcobalamin because one of the excipients upset my stomach. As far as I know, methylcobalamin cannot be converted to adenosylcobalamin and it is needed for both lipid and carbohydrate metabolism (shock horror). I still have some so will give that a try too. I shall be another (n=1) experiment. Hi renes, so trans fat does the job of activating NFkappaB that I usually look to endotoxin from the gut via gluten to perform. I can see no non-pharmaceutical approach other than strict paleo... The coeliac tests mean nothing as you realise. DH can take a year to resolve on traditional (modern junk) gluten free diets. I'd certainly view metformin and resistance training as sticking plasters. Gaining muscle is preferable to hyperglycaemia. You can always quit the exercise if you get some fat cells back! Excellent choice going with the dumbo rat. If I ever had a spare couple of million dollars, you can bet that I'd fund a real food rat study. I unearthed an ancient study that fed rats an all meat diet. The rats raised on it had bone lesions but were otherwise okay. The adult rats introduced to it were fine, other than losing some of their hair pigmentation. The author thought that this was evidence of a copper deficiency. So I cover my bases and give them some liver every week. Thanks for digging into this study... the lies and deception need the "light of day". The thing that interests me the most is the fact that your rat isn't fat. I can't say I'm surprised, but I'm not aware of a single study where they fed a rat decent quality high-fat food. That being said, I doubt it was the trans fat that made the rats fat in the study you discussed. I've been surfing the rat diet-induced obesity lit for a while now, and you can make them fat using almost any fat (except fish oil, which has its own problems at high doses). That includes lard, tallow, butterfat, and seed oils. Lard seems to be more effective than tallow and butterfat. 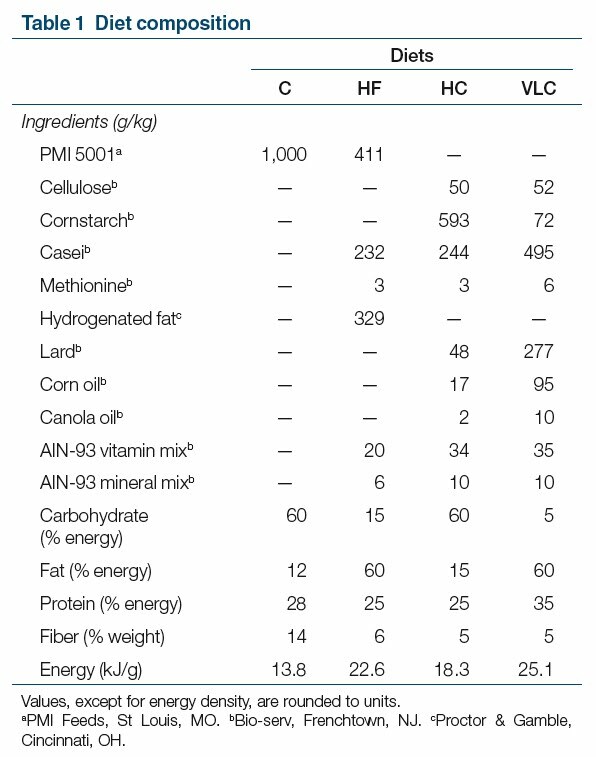 Most of the common research diet induced obesity diets now are based on lard. All of the fats they use are industrially processed, and the diets are generally irradiated or high-heat cooked, which is a recipe for AGE formation, especially if there's sugar in it such as fructose, maltoxedtrin etc. In addition, the diets are made exclusively of refined ingredients for the sake of reproducibility. 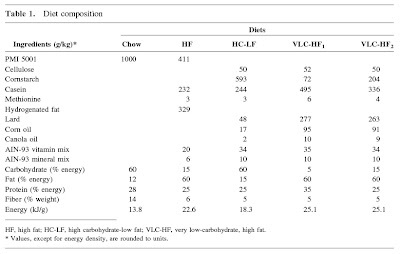 The finding that high-fat diets induce obesity regardless of calorie restriction (to a point) has been repeated with several types of fat and is not dependent on hydrogenation. Again, this is in the context of a refined poor quality diet. By the way, how old is your rat? PPS- isolated casein is usually the protein source, and it seems to make them fatter and sicker than other protein sources like beef, soy, rice protein and fish. I'm not surprised that Ratty ignores grapes. I have wild possums in my neighborhood - they are ravenous frugivores - but they show no interest at all in grapes. However possums get into a frenzy over over-ripe bananas. I also have native Australian bush rats in the garden that also love bananas. The native rats also love macadamia nuts. Macadamia nuts are native to to the region I live. - diet low in transfats? All the studies successfull in mice obecity I've seen so far have had one or more of those ingredients included. On the other hand, there is that Nature article with wild mice eating 80% coconut and with very Ratty-like outcome. Ratty's diet is moderately AGE loaded too, especially the slow fried belly pork and the mince dishes where the meat is browned with the onions as part of the way we cook. We just dollop him out some of ours. The strange thing is that there does appear to be some self consistent logic to the rat studies. The mouse study by Sylvia Ortman, with self selection of macronutrients, gave the same weight gain in LC mice as mice fed CIAB. Offered carbs were sucrose/cornstarch (they left it alone), protein was casein but the fat was lard/coconut 50:50. They were slightly more insulin sensitive than CIAB fed mice (NS but n=4 I think) on response to injected insulin. No details on diet preparation. I'll email you the pdf. Oh, the free choice LC mice ate far more calories than the CIAB mice, for the same weight gain... But I think they got Food, or something close! Obviously Ortman will never get anywhere with results like those. blogblog. Have macadamias, will offer, he loves cashews. Took a moment for the penny to drop, then I had an early morning grin of appreciation. Great stuff. Don't eat a stick of margarine for breakfast! Sucrose does seem to exacerbate the obesity and insulin resistance, although it has barely been studied in a systematic way. To make a rat fat and sick, you feed it refined food. They're generally more resistant to the adverse effects of refined food on a high-starch background diet. But there are many variables, including how the food is prepared. Large amounts of isolated casein is also not good for rats; it will contribute to obesity and insulin resistance. if you give Ratty nuts with hard shells he will be kept amused for hours as he chews his way into these treats. He will also keep his teeth in top condition. It's tempting to just give up on looking at rat studies from your comments. It certainly sounds as if you can prove what you want. I think I'll still put up the Axen and Axen 2 post as it's an interesting example of the development of a model from failure to success in terms of getting the results needed for funding success. Never mind the significance of the results in terms of what humans might do on Crisco. Don't blame the processing when it's the substance itself that is poisonous. We don't hydrogenate animal fat. We render animal fat. It's still "processing" but the end product conserves its healthful properties. Processed arsenic. It's still arsenic. I've wondered this myself. Is fully-hydrogenated corn oil as bad as partially-hydrogenated corn oil or regular corn oil for that matter? Fully-hydrogenating high omega-6 vegetable oil seems like it would be the best way to counteract all the toxic oxidative qualities normally associated with PUFA, by removing all the double bonds. In this case extreme processing might make an unhealthy substance a little less unhealthy. Then there is the paradox that naturally occuring trans-fat like CLA is linked to positive outcomes, whereas trans-fat produced during partial hydrogenation is totally demonized. It makes a lot of sense to me (and would resolve the paradox!) if it turns out that the real problem with the trans-fat in margarine is not it's trans-configuration, but the damage that took place during the high pressure, high temp, metal catalyst reaction. I imagine it's not so different from leaving regular corn oil in a deep fryer for several days, where no trans-fat is needed for it to be horrible. And at the same time CLA might show so well because it occurs in foods (red meat and diary) that have a lot of other good qualities (palmitic acid, A, K2, magnesium, etc.) and is probably taking credit for more than it deserves. Also those things are always kept refrigerated and have a short shelf life even still, so it's probably some of the least damaged PUFA in any food you are liable to find. Even pasteurized dairy is processed gentle enough to not damage the PUFA. The point where the processing probably goes too far is something like dry powdered milk, which is known for containing oxidized cholesterol. I wish we had a vet as experienced and knowledgeable as you. And I agree, it's factory (ie: Proctor and Gamble, etc.) produced fat that is bad for you, not natural fat. Wow I didn't even realise products with 17% trans fats still existed. A strange product. Of course it might not have been Crisco, but I like the idea! More blood on the hands of CSPI! There is a very simple, non-diabolical reason that the trans fat content was not mentioned in the abstract--there is a strict word limit on the abstract (you can read the whole paper for all the information) and the point of the paper was not a comparison of diets with vs. without trans fatty acids. In addition, there is plenty of evidence, from our work and that of other people, that a high-fat diet that is low in trans fatty acids can also produce metabolic syndrome. This comment is just about GTTs: What do you make of a GTT normal in all parameters except for the sharpness of the "curve" - try from baseline immediately to expected peak and then straight down to baseline within the half-hour (and staying around there the ensuing hours). This happened to me quite awhile back when tested while low-carbing. (Never had another GTT). I did feel completely wiped out during that test, as you might imagine. Never saw any explanation for this kind of curve except in a book about test results that vaguely alluded a steep chart to pituitary disorders. I'm not diabetic; have a lot of difficulty losing weight on any calorie intake (or carb for that matter but I've low-carbed and kept calories modest most of my life). Mildly hypothyroid treated with Armour (T3/T4). "Heaviest Buck" at the Rat Club Show. This is not the kind of award I'm proud of. Apart from my weight, I am very healthy (though I am starting to have climbing problems with all that bulk). I do not eat a high fat diet at all, in fact I eat a very healthy diet - grains, fresh vegetables, and small amounts of protein and bones and fruit. I don't even get nuts or seeds anymore--I'm not allowed. I eat about 2 teaspoons of raw rolled oats in the morning, and about the same of a cooked grain in the evening. I am then given as much green vegetables as I want - but there's only such much of that one can eat. By contrast,my very skinny niece eats more than a table spoon of food twice a day, and also gets treats! (Cheerios, a nut or two or a yogurt drop). I am not allowed these anymore. Yet I still keep getting bigger and bigger. My mum has tested my urine for sugar, and I pass that test, so I do not have diabetes. Even on my very restricted diet, I am finding it very hard to lose weight, and sometimes, now I feel a bit lethargic on it. My human mother tries to get me involved in games, but ever since my brother died a year ago, I am not so interested in playing anymore. 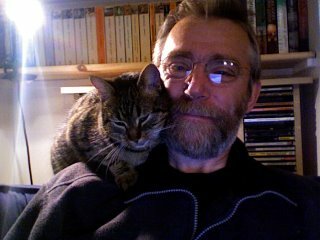 (though she keeps trying to make me move). I'd rather lie on her and have my ears scratched. Although I am happy enough to be moved to another spot once I've had my meal, if I can possibly get away with it, if my human mother doesn't see me, then I will race over and polish off whatever I can of everyone else's food. I was always a big boy; thick set, muscley, and a beautiful specimen, but I did get a little chubby, but now I've blown out completely. It' been suggested that I may be the victim of 'ginger gene'since I have a ginger-orange face (I am very pretty), and one pink eye (albinism) and one ruby eye (very dark red ). Do you have any advice for me? My vet, who is a rat specialist, doesn't think there's much that can be done for me, and that even if a blood test was done, it would be difficult to find someone who would be willing to interpret the values. I guess us ratties aren't as valuable as cats or dogs. But my human mum is willing to pay for tests if it means a diagnosis and perhaps treatment. My weight is affecting my joints, and this starvation diet is making me a bit unhappy (though I have been on it for many months). Given all you've written and studied about fats/carbs and weight gain in rats, and I don't eat a high fat (not even mod. fat) diet, do you have any suggestions to help me? Ah, you could eat less and move more. This ALWAYS works. OK, I'm lying. Or you could reduce the Reward value of your food. I think combining a boring gas/liquid diet composed of rarefied room air and one of the oxides of hydrogen in liquid form should lower your body adipostat setting to zero. In a couple of months you'll be dead thin. Or dead and thin. Failing that we're taking about some beef mince fried in lots of butter. Not much mince, lots of butter. Both Ratty and Rattigan in my house live on this and seem to stay very slim. The naughty pair tend to eat round the butter and prefer the meat and there is always plenty of butter in their bowls when it's top up time, so they're probably not in ketosis. They like their meat. Especially when cooked as bolognaise sauce or shepherds pie w/o the potato. If I went to a rat specialist think HbA1c would be the test I asked for. Even though F3666 (a rather PUFA ladened ketogenic diet) will not slim down ob/ob mice, it goes a long way to normalising their metabolism. Being slim is not everything, being normoglycaemic probably is. Particularly for your knees.